Continuing examination of these still-perplexing seasonal dark streaks with a powerful camera on NASA's Mars Reconnaissance Orbiter (MRO) shows they exist only on slopes steep enough for dry grains to descend the way they do on faces of active dunes. Many thousands of these Martian features, collectively called "recurring slope lineae" or RSL, have been identified in more than 50 rocky-slope areas, from the equator to about halfway to the poles. "We've thought of RSL as possible liquid water flows, but the slopes are more like what we expect for dry sand," said Colin Dundas of the U.S. Geological Survey's Astrogeology Science Center in Flagstaff, Arizona. "This new understanding of RSL supports other evidence that shows that Mars today is very dry." The RSL are almost all restricted to slopes steeper than 27 degrees. Each flow ends on a slope that matches the dynamic "angle of repose" seen in the slumping dry sand of dunes on Mars and Earth. A flow due to liquid water should readily extend to less steep slopes. "The RSL don't flow onto shallower slopes, and the lengths of these are so closely correlated with the dynamic angle of repose, it can't be a coincidence," said HiRISE Principal Investigator Alfred McEwen at the University of Arizona, Tucson, a co-author of the new report. The seasonal dark streaks have been thought of as possible evidence for biologically significant liquid water—sufficient water for microbial life—though explaining how so much liquid water could exist on the surface in Mars' modern environment would be challenging. A granular-flow explanation for RSL fits with the earlier understanding that the surface of modern Mars, exposed to a cold, thin atmosphere, lacks flowing water. A 2016 report also cast doubt on possible sources of underground water at RSL sites. 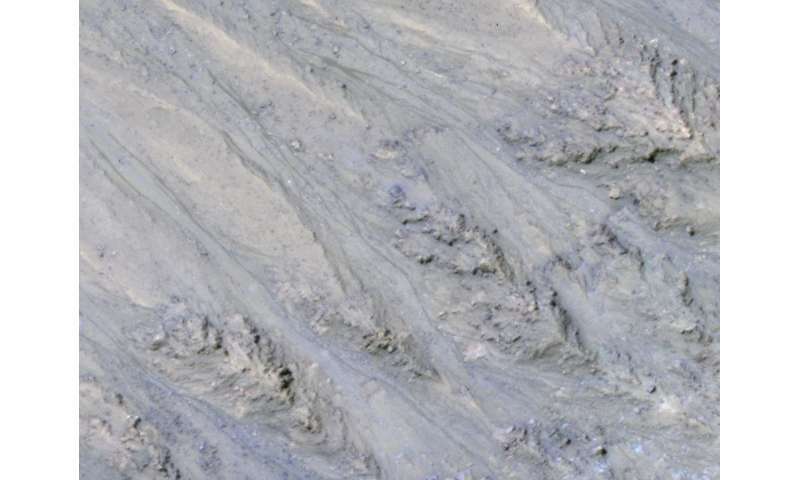 Liquid water on today's Mars may be limited to traces of dissolved moisture from the atmosphere and thin films, which are challenging environments for life as we know it. "RSL probably form by some mechanism that is unique to the environment of Mars," McEwen said, "so they represent an opportunity to learn about how Mars behaves, which is important for future surface exploration." "Full understanding of RSL is likely to depend upon on-site investigation of these features," said MRO Project Scientist Rich Zurek of NASA's Jet Propulsion Laboratory, Pasadena, California. "While the new report suggests that RSL are not wet enough to favor microbial life, it is likely that on-site investigation of these sites will still require special procedures to guard against introducing microbes from Earth, at least until they are definitively characterized. In particular, a full explanation of how these enigmatic features darken and fade still eludes us. Remote sensing at different times of day could provide important clues." This illustrates the continuing problem of quasi-religious pathoskeptics in scientific groups' no acceptance of reality while continuing to cling to Earthcentric mantras of 'uniqueness'. To continually deny the existence of water on Mars in so many ways is to actually commit crimes against humanity. This is because, like Steven Hawking said, we NEED new homes off planet in event of an planet wide catastrophe. Possibilities abound for 'wiping us out' or at least doing that to many of us, and we all soooo know that the holy rollers will have a ready answer for that one too......'tis the will of (their) gawd!! Well God had his people bioengineer long ago, as in turn those folks had been bioengineered millennia before, and so forth. NO! Our God wants us to live, prosper, and reach out from our birth world...since we fast using it up anyway like the young chick uses up its yolk and moves on to hatch. We NEED those minerals, water, and shelter in our birth system. We WILL survive! ^^^^^ There has been plenty of scientific evidence presented for current/ past water on Mars. The authors are merely saying that this particular case may not be a correct interpretation. More interesting is where the article was published. "They are dark streaks that extend gradually downhill in warm seasons, then fade away in winter and reappear the next year." On Earth is H2O, on Mars is CO2. In the winter, freezes and covers the stripes, in the summer it sublimates. Well, I have no trouble with all the comicbook fantasists who want to scurry off and escape the oncoming Matricide, fleeing to the Moon or Mars. Deluding themselves they can find another planet to infest like a metastasizing cancer. Lacking the courage to stand and fight the profitmongering polluters. Too lazy and self-centered to step up to the hard work that is needed to salvage the only known Biosphere and rebuild a future for Humanity. It will amuse me to hear their radio broadcasts pleading for everybody else to expend a fortune rescuing them from their own hubris. But gosh, you frontier-toddlers claim to be self-sufficient, manly men of impeccable survival skills. Humm, why can't you fund, invent and build your own spaceships? Stop leaching off the Public teat? Follow your cult prophetess Ayn Rand into drunken suicide. TL, your first three questions are easy to answer. "Dust"
Q.4 results in the question "What is the source of energy and the material/human resources needed for collecting the crystals in the quantities required to output a sufficient quantity of water for a colony?" Q.5 TL, What physical evidence do you have that there is specifically potable water dew fall occurring with any regularity on Mars? Q.7 rev.Q. What makes up the estimated 1% regolith of the few patches of barely scraped Mars surface that have been physically sampled? This article is an example of how often Mars researchers change their minds. Q.8 What oceans? And whatever liquidity was there? Evaporated to gases that in 1/3 e-gravity and a weak-to-none magneticfield, the thin atmosphere got blown away into space. Q. 10 Not a simple answer but a correct one would be "gossip, innuendo, rumor, lies, damn lies and drunken lies!"